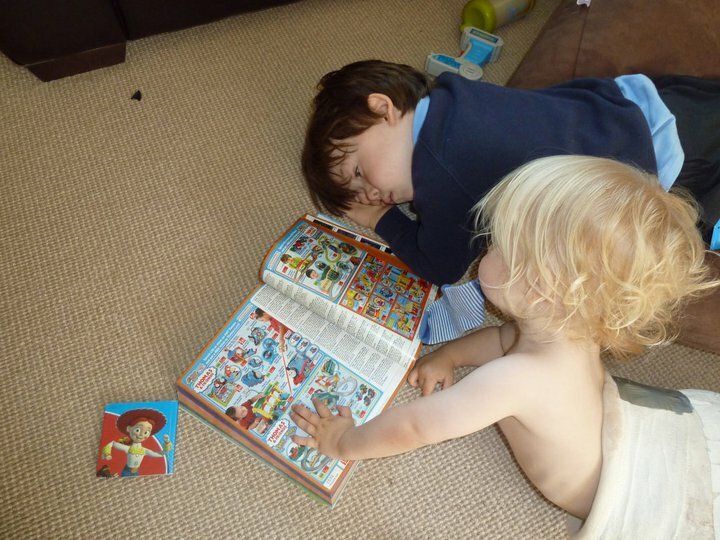 Lucas is a pretty amazing little boy, his brother is fab too, and they are reason we initially set up Spica Warrior – Lucas IS the one and only Spica Warrior and always will be. 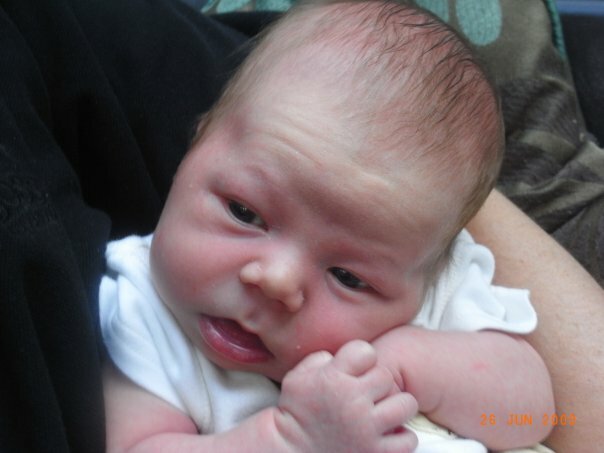 After a relatively easy birth, Lucas was born at 04.38 on 13 June 2009 and just as with Eddie our first son, it was love at first sight. A newborn check showed a ‘clicky’ right hip. Little did we know that one small word, signalled a long, hard journey was ahead of us. Whilst clicky hips are not a diagnosis of DDH, alarm bells rang given the strong history of the condition in my family with my younger sister being diagnosed as a baby and a cousin still suffering. I raised this with the nurses and was told the details would be placed on his hospital notes before we were discharged and a scan appointment would be organised. The happiness of a new baby took over and it wasn’t until Lucas’ six-week check I remembered the clicky hip and told my GP as there weren’t any details on the hospital notes. However, she didn’t think there was a problem and neither did the Health Visitor when she visited around the same time. However, DDH was now front of mind so I pushed for the scans my first son had been given because of the family history, and to this day I am so thankful I did. After the scan the sonographer told me that my son had DDH and that they would be seeing a lot more of us in the future, bam! I was told that Lucas would need to wear a Pavlik Harness for between 12 and 20 weeks and that this course of treatment would put his hip back in place. The following day we took Lucas to the hospital where he was placed in the harness and it was clear it wasn’t only uncomfortable but that it was causing him anguish and discomfort. He didn’t want to feed or sleep, the constant crying was intolerable and I felt helpless. I spent hours scouring the Internet for information but all I found was a host of horror stories, out of date statistics and images of archaic contraptions, I just wished there was just one book I could buy and take comfort from. As the days passed, Lucas was restless and unhappy, not sleeping and obviously distressed. I called the nurse to check whether this was normal and was treated like the neurotic mother I was obviously perceived to be. She told me to give him Calpol and that he would get used to the harness just as he would a new pair of dungarees from Mothercare. Ten days later we were told that Lucas’ hip was now in the right position and that all we could do now was sit it out and wait for nature to take its course and the harness was to stay on. Something didn’t feel right, my instincts kicked in again and I did a little more research and soon realised that four and a half months was pretty late for my baby to be put in a Pavlik harness and to remain in it for up to 20 weeks was ridiculous. 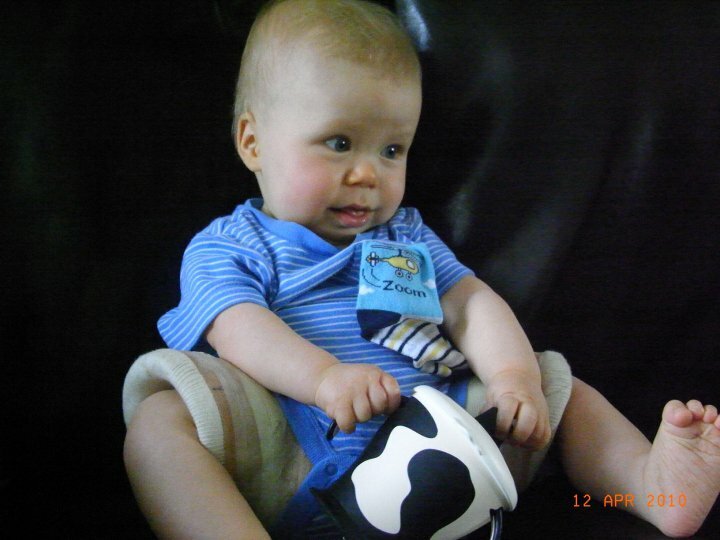 My husband agreed and during a second opinion we were told that Lucas had Tonnis Grade 3 acetabula dysplasia with subluxation on his right hip and only surgery would correct the problem. Christmas came and went in a blur and in February 2010, at just eight months old, Lucas was admitted for a closed reduction, the first of many operations.They wheeled Lucas away from me and then bought him back several hours later in a frog plaster, I was so sad but didn’t let it show. The staff were kind and showed us both how to roll him over, lift him, change him and together we worked out the best ways for him to fit into his buggy and the new car seat we had bought for this day. The operation was done, the cast was set and life went on back at home. We kept things as normal as we could, but I won’t lie, it was hard. At nine months most babies are trying to crawl and pull themselves up on the furniture and putting their feet on the floor but my baby couldn’t do that. He coped amazingly well and adapted to the situation. Eddie would play with him on the floor, bringing him puzzles and books to look at and sit with him watching TV on a massive beanbag. When we went out and about, I’d feel anxious, like people were actually staring at us. At first the anxiety was almost overwhelming, but as time went on and he grew used to wearing it, my self-esteem improved and now I can see that in overcoming other’s reactions, I felt empowered to fight for the hips my son deserved. 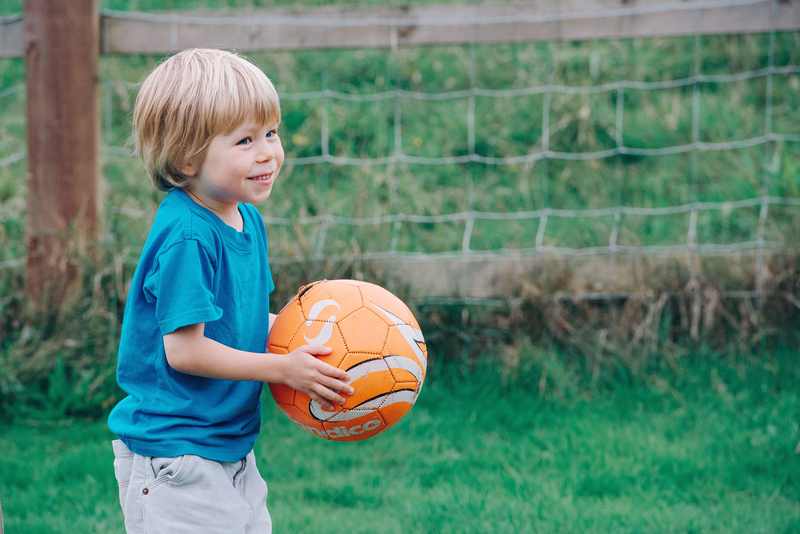 At the end of July we were thrilled to be told that the closed reduction had worked, the ball and socket were sitting neatly in place and we had to now give Lucas’ body time to grow and heal. As the months went by, Eddie started school and Lucas and I would spend time together building his strength, going to soft play classes and making up for the lost months he spent in a cast. His leg lengths were fine, the creases were matching, he was expert crawler and could pull himself up on furniture but I had a nagging feeling something was wrong and at an earlier than scheduled appointment our world crumbled again. We were told that Lucas’ hip wasn’t forming as they had hoped and he was booked in for an open reduction and a femoral osteotomy in June . I was broken. I didn’t think I could do it again. I didn’t want him to suffer again. I didn’t want him to have metal bolts in his hip. I didn’t want his leg to be broken and repositioned. I didn’t want him to spend another six months in a cast from his chest to his ankles with a stick between his legs. Those early feelings of anxiety came flooding back – I didn’t want people staring at him again. I didn’t want to have to ask my family and friends for help and support. I didn’t want Eddie to have to be second best again. I didn’t want my marriage to be put under pressure again. The thing was, we didn’t have any choice, it had to be done. The day of surgery arrived and I just wanted to get it over and done with and carry on with our lives and beat DDH. The nursing staff were amazing and couldn’t do enough to help us but I actually found round two more difficult than the first time round. The walk down to theatre broke me, I didn’t want to let go of his tiny, limp hand once he was under but I walked away knowing that we were one step closer to the finish line. After several hours in theatre he was back in recovery and in a full body spica with a broomstick between his legs. He picked up pretty quickly and after a night on the ward we went home. 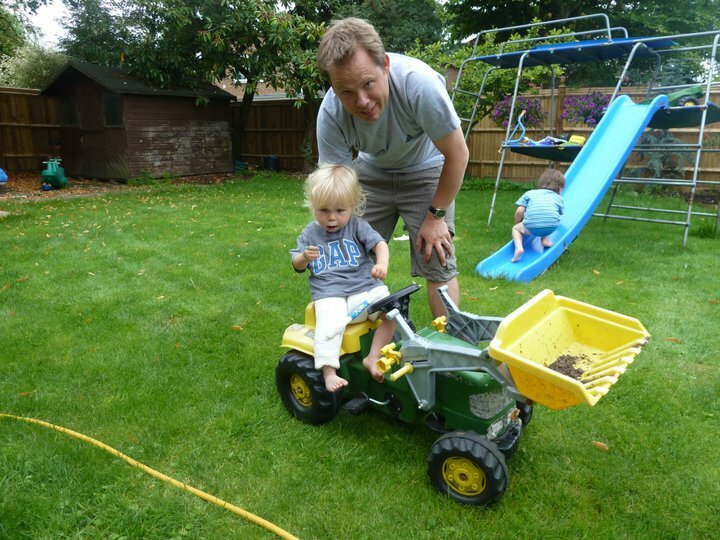 I was on autopilot and worked out the best way to carry him, how to change his nappy (the hole was bigger this time) and the narrow spica meant he was able to fit into the buggies we had at home. It is fair to say that over the nine weeks Lucas was in this spica he became increasingly angry and frustrated. He almost stopped talking instead choosing to scream and grunt. He would smash his cast on the floor and his eyes lost the sparkle that had made them dance only weeks before. We did all we could to make him happy. We had a spica table, bean bags, two sets of wheels and for his birthday he got a ride-on tractor that worked with his cast – that did get a cheeky smile of approval. We would go to the park where he could fit in the swings and luckily it was a good summer and he loved to be in the garden with his brother. He was pretty good at getting about and by the time he was set free his upper body strength was impressive and there was no stopping him when it come to moving around in his cast but he wasn’t happy, little things frustrated him and he closed down just a little more each day. Strangers still stared, there was the odd tut and raised eyebrows but I tried to let this go and was just thankful that he wouldn’t remember any of it . Those who did ask what was wrong often had experience of DDH themselves and were very sweet and concerned – that made a big difference. 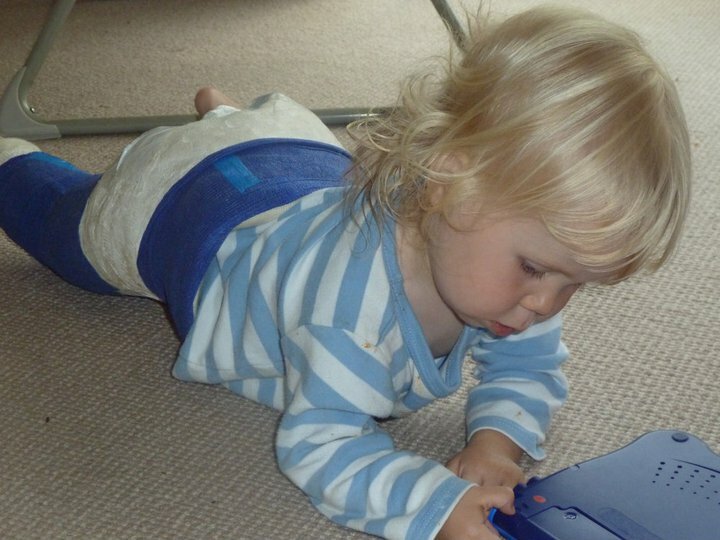 Each day was marked off on a sticker board and eventually it was time for cast to come off which was traumatic to say the least, as he didn’t want anyone to touch him, he just wanted to be close to mummy and daddy. The silver lining was that his hip was now in place, the open reduction and femoral osteotomy had been successful and we were free to go home. There were tears of joy and relief, hugs and kisses. I had my boy back and on the way home he said “mummy” and I crumbled as it was the first time he had spoken properly for weeks. 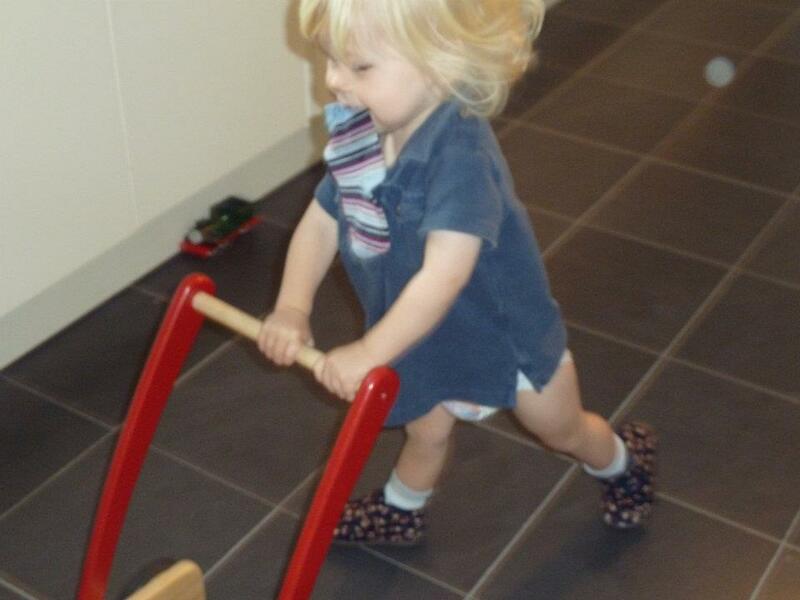 A year on from that surgery, his metal work was removed, he started school and his anger started to subside. He has become Lucas, the little boy he was trying so hard to be and not the kid in a cast. ‘Be careful’ and ‘stop’ were core phrases in our parenting vocabulary and as much as I wanted to protect the legs we had worked so hard to fix, if I didn’t let him spread his wings and fly, what would have been the point? Lucas is now six and after three clear years, an X-ray at our last annual check revealed that as a result of Lucas’ femoral osteotomy, his legs aren’t the same length and he needs a pelvic osteotomy. This news floored me when we were told. I wasn’t expecting it. We thought we were done with DDH but DDH had other plans for my son. In November 2015 Lucas had a pelvic osteotomy. This was his fourth and largest operation to date. He was so brave. He was away from me for over four hours and his recovery was pretty scary. We got him back onto the ward and after a very traumatic evening we got his pain under control. We spent four nights at the RNOH and after what felt like a lifetime, went home. Lucas spent the next seven weeks unable to weight bare but he was so strong and brave he amazed us all over again. He hated the frame the hospital gave us so would use a wheelchair and I would carry him to the toilet, car and up to bed. We didn’t want anything to happen that could cause him to fall so I taught him at home and a tutor would come and visit for an hour a day. Just before Christmas 2015 we were given the good news that things were looking positive but after hardware was removed in June, another x-ray in August 2016 showed that whilst progress has been made, this journey isn’t over for Lucas . Lucas is now 8 and doing so well but he still has one leg longer than the other which could cause problems moving forward. He has a rise in his shoe and at some point he may need surgery to correct this which means it is a wait and see situation as his body grows. He has appeared in many magazines and newspapers, he has swam with Gemma Almond, the Paralympic swimmer with bilateral DDH, he is the reason his entire school walked a mile for healthy hips and he appeared on TV talking about that event. 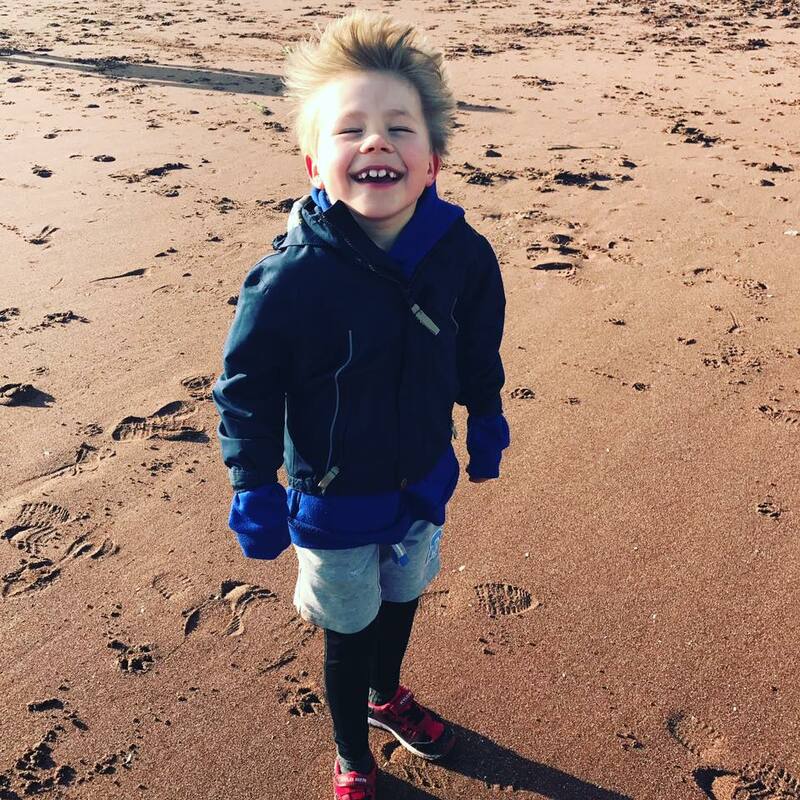 Lucas is our very own Spica Warrior, our charity mascot, the face of DDH UK and one amazingly brave and determined little boy who is known around the world and loved by so many. I love my boys and husband more than I ever thought possible and whilst DDH has revisited us time and time and time again, we are living and loving the life we have and take this new challenge one day at a time and Lucas (Spica Warrior) is my hero.